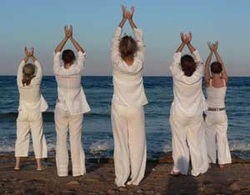 Medical Qi Gong Therapy is the oldest therapeutic modality of Traditional Chinese Medicine. It is a comprehensive system of health care addressing the root cause of symptoms or disease, and treats the client as a whole. The practitioner, drawing upon the ability to sense and manipulate energy developed through dedicated study and self-cultivation, uses qi emission and/or teaches medical qi gong exercises and meditations based upon a differential diagnosis rooted in Chinese medical theory to restore health and wellness.